It’s relatively early Monday morning as I write this, but it’s clear there has been a material change in the weather pattern. For the past week, the dawn skies have begun the day blue and cloudless, with a creeping dry heat that meant it was best to get the shades drawn and the fans fired up. But today the skies are spread with featureless grey. High fog and an actual hint of moisture today gives the impression that the cook-off of last week has been suspended. As JimG and I descended from the top of Mt. Tamalpais yesterday afternoon, we could feel the start of it - an abrupt chill in the winds which came off the leading edge of the coastal fog. Still, up until that point, we had been getting cooked up pretty good. But, as we wound our way down the switchbacks of the mountain, I was glad I’d done this ride. It didn’t really start out that way. Honestly, I’ve been a bit tentative in wanting to ride with others. Feeling heavy on the climbs, pokey on the flats and having a more than significant amount of people buzz past me while out on the roads. When I read JimG’s “Let’s Ride” email on Saturday evening, it was with a slight amount of dread. Not that I didn’t want to ride. When that happens, I’m either honestly sick or you should check under my bed for the remains of a human-sized pod from which my android analog has emerged. But, I did know that this was going to hurt. It wasn’t helped by the knowledge that I’d be climbing the mountain on the Quickbeam. This was, of course, quite by choice and action. The Hilsen has not yet been fully morphed into proto-Cyclocross mode and I really had been trying to ride the Quickbeam more recently. In trying to regain some semblance of fitness after months of bad sleep and minimal riding distances, I’ve tried to ride fixed or single-geared most of the time. As I’ve mentioned, this tends to strip away any artiface and confusion regarding how you are riding. It tends to make you stronger, remind you of the need to honor momentum and let’s you focus on pushing the damn pedals. It also tends to hurt. And so, I was contemplating the longest loop I’ve done in a while, and knowing that there would be suffering involved. My evil subconcious did its level best to protect me. When little dog woke up an hour or so in front of the alarm clock, it caused me to unconciously trip the lever, so that I slept solidly until the moment that I needed to be out the door to be on time. I made a pre-coffee call to JimG, who luckily had not left. We pushed back the meeting time to 10:30. I finally oozed out the door and commenced pedaling. Suprisingly, the hills didn’t really hurt, and I actually seemed to have some snap in my legs when traffic demanded it. We rolled up to the meeting spot within view of the other and after greetings, headed toward Mill Valley. While on the slight rise up the valley, things felt good, and JimG related his tale of tracking down a Large Bontrager mtb frame recently. Upon reaching the Railroad Grade trail head, we continued climbing. When in better shape, I’ve rolled up this trail on the fixed side of things. But, it was pretty clear that was generating more noise than music today. We eased to the trailside at a good spot and I flipped over to the lower gearing of the freewheel side. With the clear weather and siren song of fall warning of winter, a number of riders and hikers were enjoying the trail. We latched onto the pace of a full-suspended rider who had dropped his buddies, and crossed paths with various gaggles of singlespeeders. At some point, a guy on a cross bike steamed past us at a much brisker clip. I took a few photos to distract myself from the creeping awareness that I was still pushing too large of a gear. We kept talking a bit. Easy chatting with ourselves and other riders, catching each other up and commenting upon other bikes we came across on the trail. One thing we briefly discussed as we climbed was carbon fiber failure mode. There have been a steady number of reports this summer of nasty breakage of CF forks, frames and (over the weekend) wheels. (Some graphic post-ER photos in the set). 1: When carbon fiber was new, the companies messing around with it understood that if it broke, CF would get a bad rep. My guess is that the initial frames and forks were overbuilt - heck, the first CF bike I had used a steel steerer tube! This was exotic material. They had to have zero failures, if for nothing other than marketing purposes. After a few years of success, some quiet failures (it seems no one really remembers the early OCLV road bikes that had BB shells that came unstuck, and roatated within the frame…), the race was on to use lighter material in the layup (It went from “proprietary information” to 120 to 110 g/sq. m in the course of a few years). I’m not sure if they also reduced the amount of resins used in the manufacturing, but it wouldn’t suprise me. You go lighter - in any material that I know of - and your margin for error lessens considerably. 2: When these projects began, I have to believe that a select group of “A” Teamers did the work. Now, just given the sheer quantitly of CF production, this cannot be the case in every manufacturing company. At the beginning, I’d bet the design and fabrication teams doing the CF layup and building were closer to the hand-done, custom end of things. Now, it’s the assembly line method, which means workers with good days or bad days, and with the vast quantity of items made, more variance in materials and construction. I think it’s one thing to underbraze a bottom bracket shell, but quite another to not have optimum dispersion of resins through your layers. Again, you get back to failure modes, and CF ain’t forgiving. Update - Beth H. had a great post on this today as well - raising the point that all this racey-race gear has no place on a practical bicycle anyway. Update again - And, yes, I realize steel can fail. And we continued climbing. I finally said, “Aw piffle” (or something close to that) and dropped down to the small front chainring. This final change of gearing helped, and after a water and chat break at West Point Inn, we motored up the last bits of trail to the summit at East Peak. We broke for lunch, watched folks come and go and observed a work crew (on a Sunday?) shoveling rocks and dusty dirt into a Bobcat front loader. Then we left the mountain top and climbed our way to the descent. As I think I’ve mentioned before, the East Peak of Mt Tamalpais is one of three bumps on the mountain top. Thus, you quickly end up climbing, when you really feel like you deserve an immediate downhill. Delayed gratification at its finest. From here we could see Mt. Diablo poking up through the heat of the East Bay, while to the south and west, an impenetrable layer of fog covered parts south and the Pacific Ocean. As foreshadowed earlier, we descended for what felt like hours - I remembered again just how well the Quickbeam handles paved, twisting descents. I’d swapped the tires for Jack Browns a while ago, and the confidence factor was silly-high. I don’t think I exited a turn without thinking that I needn’t have used quite that much brake. When we finally regained sea level again and I flipped back to fixed and turned for home, JimG tagged along to get a few more miles in the bank. (The most recent ride he’d done was the RUSA 10th Anniversary Brevet back in August. The man has some base miles…) When we stopped for a brief tech-check, a lanky rider on a Salsa Casseroll came over and saw through our secret identity power-cloaking field of deflection. He correctly ID’d me and JimG, and we chatted for a while. It was the first time I’d had a chance to see a used-and-enjoyed Casseroll in the wild. He had it smartly set up in singlespeed mode, and had just returned from his own loop up Railroad Grade. Nice looking rig. And, good to meet you, Jeremy! The heat increased as I headed home, and both my shorts and jersey had been noticeably enhanced by white contrasting stripes. But, it had been a good loop. If nothing else, it helped get my brain around the obstacle of increased miles and riding with a good friend is a great way to keep your mind off your own troubles. Even through the heat and continued efforts, things continued to feel better as the ride progressed. Not sure if I would’ve been up for another loop up Railroad Grade, but the Camino Alto climb went by without serious engine knock, and after JimG peeled off for the City, I was able to set a good steady pace home. All in all, a darned fine way to spend a chunk of Sunday. Last update - JimG has posted his photos over at Flickr. September 8th, 2008 at 2:10 pm Fantatstic post, ‘fiend. You hooked me with the relevant weather eye, and pulled me in with the truth about crapbon fibre. September 8th, 2008 at 2:58 pm Jim- Twas good to meet you two as well! The Casseroll is a great bike, one of these days I’ll appropriate the girlfriend’s camera and snap some pictures of it for the gallery. And BTW, I guess JimG did intercept me on the bridge, but i had stopped in Sausalito for a sandwich and an iced coffee, and actually saw JimG pass on his way back. I don’t remember passing him on the way up- he must have come up via fort baker. September 8th, 2008 at 4:53 pm Next time, I’ll throw a freewheel and some CX tires on my fixed-gear…. September 9th, 2008 at 12:35 pm must. move. back. sigh. September 9th, 2008 at 12:58 pm Well Gino & tarik - if’n you outta-towners show up unexpected-like, give a call, alright? Always good to ride with ya. Jeremy - y’gotta watch that JimG - he’s a crafty one. September 9th, 2008 at 1:23 pm I have to admit, I do wonder if we hear about all that CF breakage in part because most of the people who expose their bicycles to the kind of risks that break parts are the racers and high-speed roadies. Don’t get me wrong; though I think that carbon fiber is not much more prone to failing under “just riding along” conditions than is steel, I don’t think that it has any place on what you’re calling a practical bike. My road racing bike is not a “practical” bike unless you intend to ride fast or race with it (which are impractical activities anyway, but so are long-distance tours, usually), and I’m perfectly happy to have a carbon fork. I’m not worried in the least about breaking it unless I crash. But there’s no reason for my Long Haul Trucker to have any carbon bits. Aside from the lack of toughness - carbon doesn’t lack strength, just toughness - it’s just a foolish waste of money and material. I think that there are actually a couple different problems, only tangentially related to the weakness of carbon as a material: first, it is designed for lightweight riders (people with racing fitness) but not marketed as such, and second, most of the people working in bike shops are there because they are enthusiasts for the SPORT of cycling. There are tons and tons of practical bikes and equipment out there, a lot of it much more affordable than Rivendell (no offense to the folks there at all!). 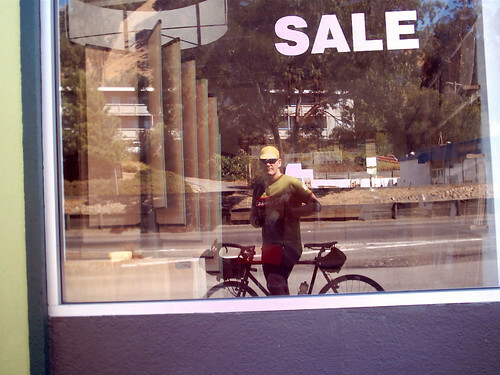 A lot of bike shop employees don’t know anything about it and will happily sell sporty equipment to someone who needs something beefy and practical. The industry is actually doing a great job of developing and selling products that serve the non-sporting, non-bike path population of cyclists - Quality Bicycle Products has been a real leader in this regard. But a lot of the people on the ground (and yes, a lot of people in the industry) still aren’t doing their parts. September 9th, 2008 at 2:22 pm Good points. I will say that the paradigm of “when you are serious about cycling, you race!” is a hard one to discard. In the scheme of things, we are still decades behind many other countries in terms of thinking of bicycles as other than recreational toys or racing machines. I do see that changing, and the attention to detail put into more versatile designs both at the custom end (at NAHBS) and the intro level (Thanks to QBP, Merry Sales and others) is very encouraging. One thing that still concerns me about Carbon is the failure mode and the inability to reliably detect stress/failure issues. It’s hard enough on aluminum cranks, which are right there to see. Detecting internal delamination within the cabon and resin layers is pretty tough in my book. I’ve wracked it pretty hard on steel frames while just bending things. The only carbon part I’ve had fail were cranks, but they went from “just fine” to “twisting apart” with little warning. It they had not had an aluminum spine, they would not have remained together.